Color camera (e.g., Camera DFK 23UX236, with IC Capture 2.4 software) or equivalent color camera from other vendors (AutoFluorFIG 1). Note, monochrome camera is unable to distinguish between colors, so the filter set would be ineffective. Chroma Technology, catalog number: ET485/10x, 25 mm, ringed). Note: Currently, the ET485/10x filter is not listed on Chroma Technology website and you need to request it directly. Empty microscope filter cube that fits your microscope type. Note that the above listed sizes (25 mm and ringed) fit the microscope filter cube of the Tritech Research microscope model: BX-51-F (AutoFluorFIG 2). Hence, depending on your microscope filter cube, you may need other sizes and specifications. The triple band filter set consists of the ET485/10x excitation filter, the 69000bs dichroic beam splitter, and the 69000m emission filter (AutoFluorFIG 3). 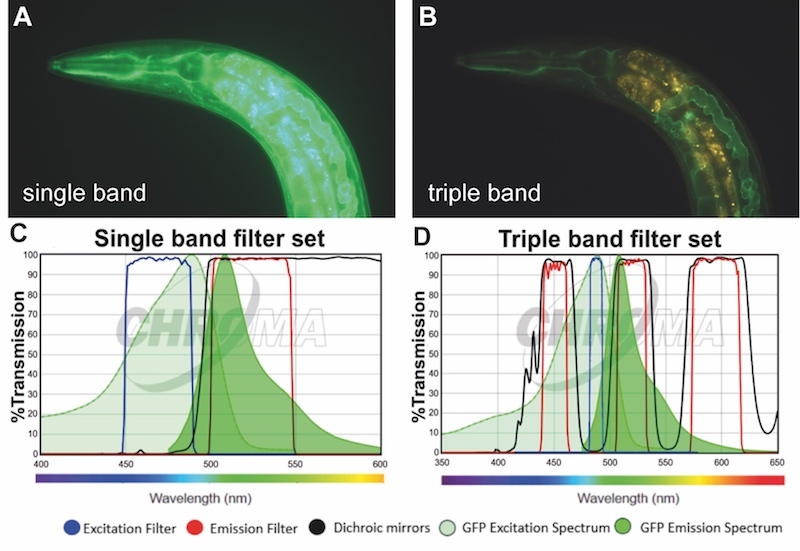 The 69000m emission filter allows light coming through from 520/20 nm (green) and from 595/40 (yellow to orange/red) but blocks the greenish to yellow light (535-572 nm), which is the key feature of the triple band filter set that allows distinguishing GFP from autofluorescence (AutoFluorFIG 4). For more details, please see Teuscher and Ewald, 2018. Exchange the excitation filter 69000x with the ET485/10x narrow band excitation filter. Assemble the ET485/10x excitation filter, the 69000bs dichroic beam splitter, and the 69000m emission filter in your microscope cube. The order depends on your microscope setting. See AutoFluorFIG 1 and Teuscher and Ewald, 2018 for the schematic setup for the Tritech Research microscope model: BX-51-F.
With this triple band filter cube, the GFP will be visible in green-aqua marine, the YFP in white-yellowish, and the autofluorescent intestinal gut granules in yellow-brownish (AutoFluorFIG 4). This is directly observable when you look through the microscope and can be captured with a color camera. AutoFluorFIG 1: Microscope assembly. 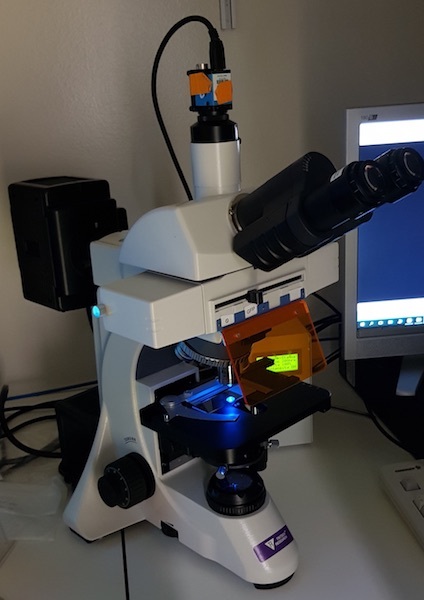 Upright bright field fluorescence microscope (BX-51-F, Tritech Research) with color camera (Camera DFK 23UX23) on top. AutoFluorFIG 2: Filter cube assembly. Photograph shows filter cube in the microscope holder (BX-51-F Tritech Research). AutoFluorFIG 3: Schematic of filter cube. 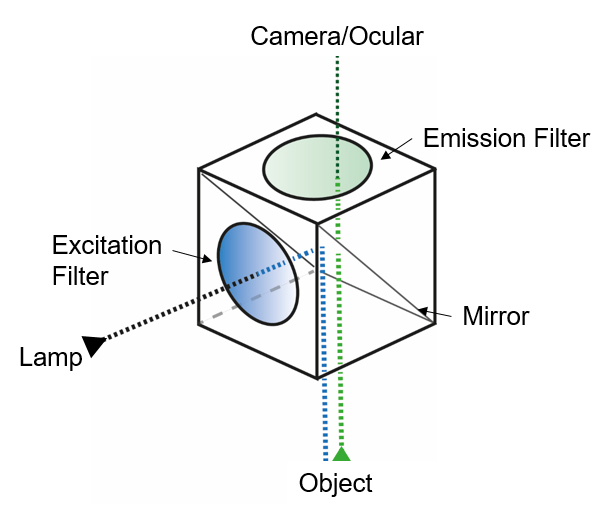 The dashed lines indicate the path of the light through the filter cube, while the arrows indicate the locations of filters and the mirror. AutoFluorFIG 4: Imaging using the triple band filter set. A&B. The BT24 C. elegans strain expresses hemicentin, an extracellular protein, tagged with GFP (GFP::HIM-4), which is localized around basement membranes. A transgenic BT24 C. elegans at day 8 of adulthood imaged with a commonly used single band filter set (A) and with the the triple band filter set (B). For (B) GFP is displayed in green and autofluorescence in yellowish color such that the GFP signal and autofluorescence can be distinguished from one another. C&D. Transmission graphs adapted from Chroma. C. Single band filter set used in (A) [49002-ET-EGFP (FITC/Cy2)] and D. the triple band filter setup used for (B). Please contact the Ewald Lab with any questions.